It’s hard to believe, but it’s been almost one year since I participated in Taste and Create last time. Taste and Create is a monthly food blog event organized by Nicole from For the Love of Food blog. The participants of the event are paired together and have to try a recipe from each other's blogs. This time my partner was Natalie from Oven Love food blog. Natalie made my corn soup, while I opted for her delicious whole-wheat pancake recipe. I’ve never had American pancakes before, so when I saw the recipe on Natalie's blog, I thought it’s a perfect occasion to finally try them. They looked amazingly tasty, and seemed more healthy than most of the pancake recipes I’ve seen so far. The pancakes came out truly delicious, incredibly soft, delicate and very fluffy. In the original recipe they're served with strawberry sauce, which is basically chunky strawberry puree with a little bit of maple syrup. The sauce didn't come out particularly sweet, and since the pancakes aren't themselves very sweet either, I served them with some honey to drizzle. Enjoy!!! 1. Mix together the flours, baking powder, baking soda, and salt. 2. In another bowl, beat together the eggs, milk, buttermilk, honey, and vanilla extract. 3. Preheat a large nonstick griddle or skillet over a medium-low flame. only enough to combine them. The batter should remain lumpy. 5. Use a 1/4-cup measuring cup to ladle the batter onto the griddle or skillet. 6. 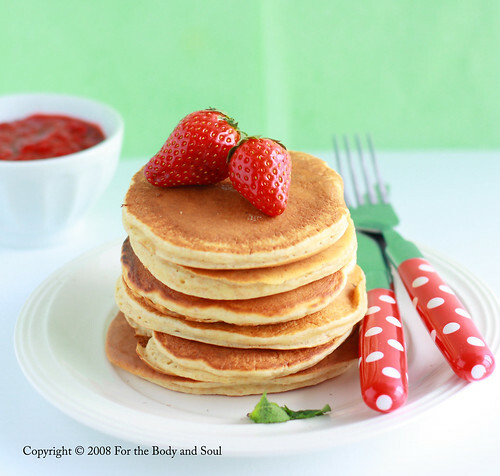 Cook over medium heat until small bubbles appear on the surface of each pancake, then turn and cook until golden brown. 7. 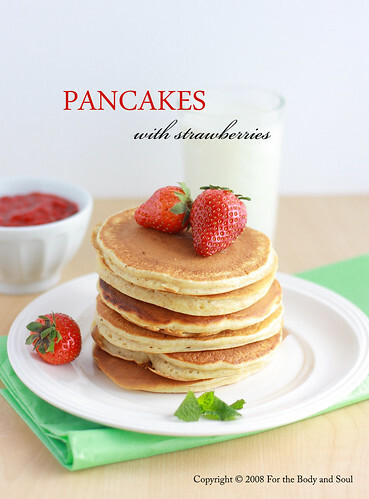 Serve warm with the strawberry sauce and maple syrup or honey. 1. Using a food processor, process the strawberries into chunky puree. 2. Place together with the lemon juice in a small saucepan. Heat over low heat until warm. 3. Stir in the maple syrup. Hi, I love your cute pancakes!! MMMMM....lovely!! These pancakes are perfect , i loe them! I received your message and it is TOTALLY ok with me. I understand...stuff happens. :o) I was actually early this time because I can't work! Your pancake llok so light and tasty. Oh that looks soooooo yummie, I love it. And also love your blogg it's amazing, I bookmarked your site and come back, very soon.